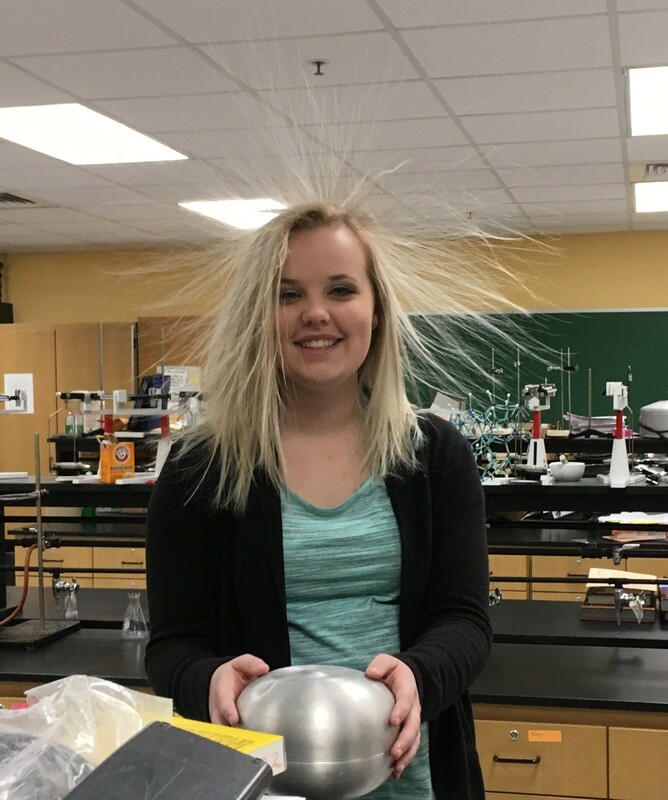 Nicholas County High School – Mr. Shifflett’s Chemistry classes experienced the effects of static electricity through a static electricity generating device. This occurred about midway through the third semester of this 2017-18 school year on February 9, 2018, during regular class time in Mr. Shifflett’s classroom. Mr. Shifflett does this project about once every four years, so it was a privilege to get to participate in this activity this year. Throughout the activity, the students gained a fuller understanding of static electricity and how it relates to the study of chemistry through a hands-on approach. “Is it going to hurt me?” said Emmalea Johnson. “No, it will only hurt a little,” joked Mr. Shifflett. Students were encouraged to not use any hair conditioners prior to participating in this experiment because the conditioner causes the hair to resist the effects of the electric current (the effects are the hair standing straight up). The students constructed a barrier of about five textbooks to stand on to prevent being grounded. Then, the students gently placed their hands on the static electricity generator to obtain the charge. After about three minutes, most of the students’ hair began to stand up. The students stood there for several minutes to experience the full effects of the static electricity generator. When the students were ready to stop, they just let go of the static electricity generator and stepped off the books. The students’ hair slowly laid back down within the next minute. The whole class actively participated in this endeavor, enjoyed it, and gained much educational knowledge. “I think that everybody had a great time during this,” said Mr. Shifflett.